Vignale, situated on the hills of Monferrato, provides restaurants, bars, and shopps for its visitors and population. Close by are several recreational offerings like Golf, Tennis, Boccia or horseback riding. The internationaly renowned dance festival Vignaledanza is held each year during the summer. It offers a varriety of modern and classical permformances. Nearby are several riding stables, public swimmingpools and a Golf course. The Lago Maggiore and the ligurian sea are only 1 hour away. The slopes of the alps or the apennin are not much furhter. Piedmont is surrounded on three sides by the Alps, including Monviso, where the Po rises, and Monte Rosa. It borders with France, Switzerland and the Italian regions of Lombardy, Liguria, Aosta Valley and for a very small fragment with Emilia Romagna. It is broadly contiguous with the upper part of the drainage basin of the river Po, which rises from the slopes of Monviso in the west of the region and it's Italy’s largest river. The Po collects all the waters provided within the semicircle of mountains (Alps and Apennines) which surround the region on three sides. From the highest peaks the land slopes down to hilly areas, (not always, though; sometimes there is a brusque transition from the mountains to the plains) and then to the upper, and then the lower the great Padan Plain. The boundary between the first and the second is characterised by risorgive springs, typical of the Padan Plain which supply fresh water both to the rivers and to a dense network of irrigation canals. The countryside is very varied: one passes from the rugged peaks of the massifs of Monte Rosa and of Gran Paradiso, to the damp rice paddies of Vercelli and Novara, from the gentle hillsides of the Langhe and of Montferrat to the plains. Since 2006, the Piedmont region has benefited from the start of the Slow Food movement and Terra Madre, events that highlighted the rich agricultural and viticultural value of the Po valley and northern Italy. 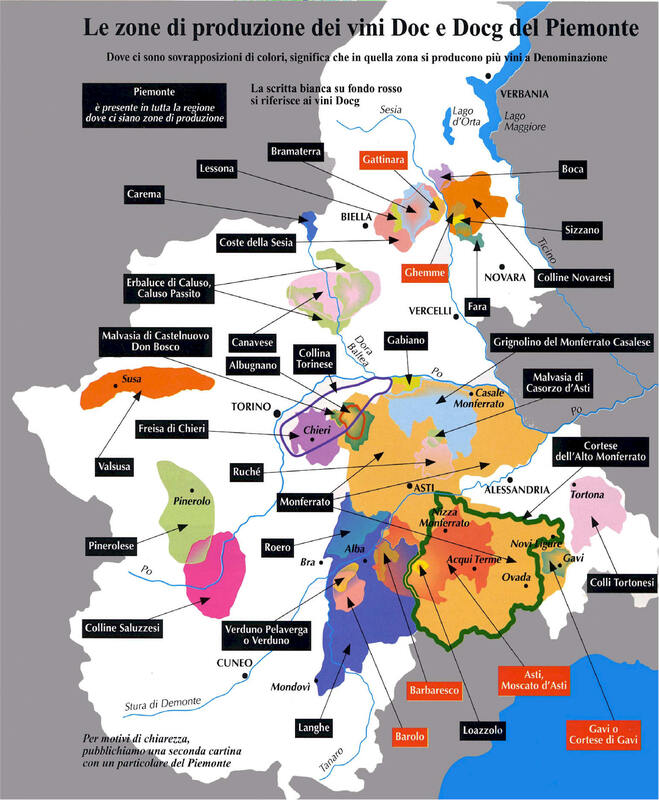 Monferrato is at the heart of the piedmont. A beautiful hillsite between Casale and Acqui Terme. In the north, the Po marks the border. 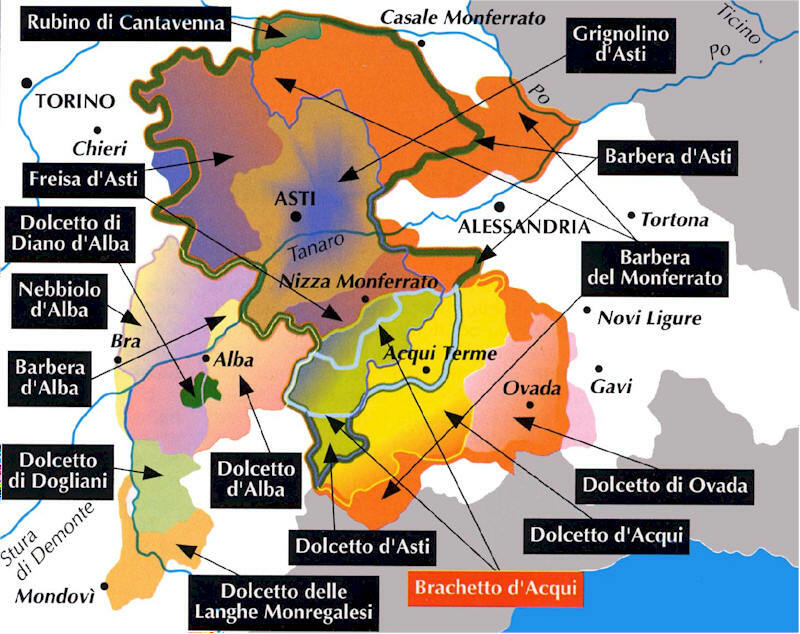 The famous wine cities Alba and Asti offer a unique atomsphere.